Are “brain dead” patients really dead? If so, why are there so many news reports of people declared “brain dead” waking up? Take for example the headlines below from ABC, NBC and a Syracuse newspaper. The answer is: they were never truly dead. Brain death criteria is a fraudulent diagnosis that was concocted in order to get at vital organs. 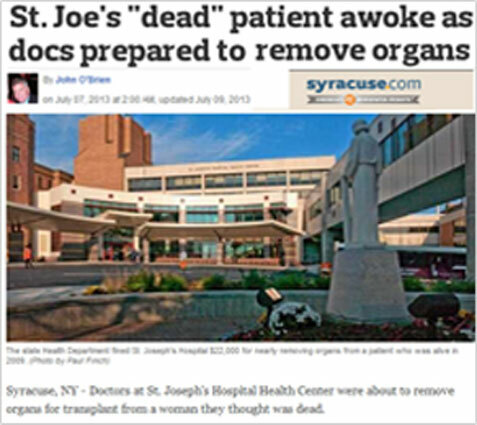 In each of the three cases above, plus many more, an organ harvesting team was minutes away from removing the person’s vital organs, when he/she "miraculously" woke up. 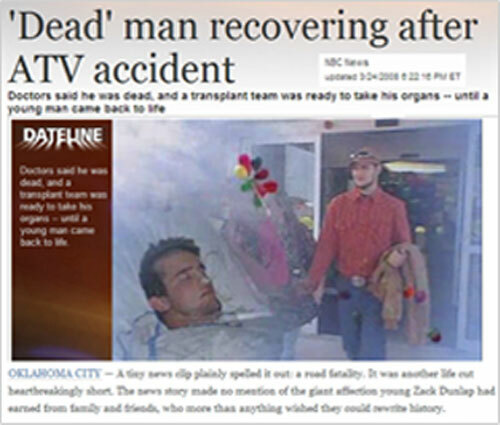 The NBC story from 2008 concerned a 21-year old man, Zack Dunlap who was in a car accident and declared ‘brain dead’ by the doctors. (His drivers license indicated he had given consent for organ donation). Zack was minutes away from having his organs harvested when his cousin had a feeling Zack was not dead. He ran his pocket knife across his foot, and it jerked. Then he dug his fingernail under Zack’s, and he drew his arm across his body. The organ harvesting process was stopped and the harvest team sent away. Zack later had a full recovery and said he could hear them talking about him being brain dead but couldn’t speak or move. Dr. Christian Brugger, an American bio-ethicist who has questioned the veracity of brain death criteria, cites examples of people that were declared brain dead but who went through puberty and even gave birth. He asserts, and quite logically so, this is evidence that these people are still alive. The fact is that brain death is not real death. In 1968, an ad hoc committee was formed at Harvard University in Boston for the purpose of redefining death so that vital organs could be taken from persons declared “brain dead,” but who in fact, were still alive. Prior to 1968, death was determined by checking for whether the vital signs were present including temperature, pulse, blood pressure and respiration. A person who has been declared brain dead still has all these vital signs. A cadaver does not have a pulse, nor blood pressure and if you place a thermometer under its tongue, there won't be a temperature. This is the truth: when you remove someone’s heart, or both lungs, or their entire liver, that is what kills the person. Why kill people? Why not wait until the person truly dies? The reason why they developed this fake diagnosis is because vital organs are unlike skin tissue, eye tissue and various other body parts which stay “fresh” for a relatively long time after death. Heart tissue for instance, becomes damaged within a short period of time after blood and oxygen stop circulating, rendering it unusable for someone who is waiting for a transplant. The only way to preserve vital organs (heart, liver, lungs, kidney, pancreas) is to remove them before blood and oxygen cease circulating. In other words, while the donour is still alive. These medical experts agree that donours are alive and it is in fact the organ harvesting team which kills them. However, they justify this utilitarian practice by arguing that it is for the greater good, and that someone, in a coma for instance, has poor “quality of life” and their organs would be better put to use to save somebody else who will have a higher “quality of life”. Sound a bit macbre? 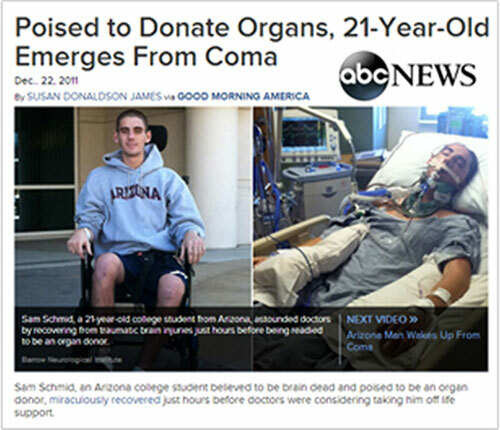 Few people know that organ donation is a billion dollar industry. It is in the financial interest of those who profit from transplations to pretend that living donours are dead. Patrick McMahon is a nurse practicioner & former employee The New York Organ Donor Network who is suing his former employer over ghoulish scenario in which he alleges 1 in 5 patients who were declared brain dead & had their vital organs harvested, were actually alive. McMahon allegedly witnessed cases where the patients still had brain wave activity, were squirming on the operating table as doctors cut into them and had to be given a paralyzer to keep them still. When he expressed concerns to the CEO, he was allegedly told “That’s how things are done”. McMahon says he was fired shortly thereafter. The lawsuit also says that the firm hired “coaches” to train its family counselors on how to obtain consent notes from emotionally vulnerable family members whose relative succumbed to an injury or illness. He referred to these coaches as sales and marketing experts who teach high-pressure sales tactics to play on the emotions of family members. Is all organ donation unethical? No. Tissue and other non-vital organs can be harvested from a consenting donour without causing the person’s death. For instance, it is morally acceptable and quite a noble thing to donate one’s skin tissue so that a burn victim can be restored, or eyes so that someone else’s vision can be saved. However, it is never licit to commit evil in order that do some other good. Across Canada, there is a tremendous push to pass provincial laws that automatically make you a donour. These laws require you to actively opt-out of being one. Could this result in people being declared brain dead and killed against their will? Yes it could. That’s why we need to educate our provincial legislators about the scam that is brain death criteria. Please also educate your family doctor. The more people who become aware of this fraudulent practice, the better our chances of one day ending this barbarism.